We all understand the importance of a fire sprinkler system in the home or office. These systems cut the risk of fatalities in a home fire by 82 percent. However, not many know the difference between the two types of sprinkler systems: wet pipe vs. dry pipe. In wet pipe systems, the sprinklers are connected to wet pipe systems, so the sprinkler itself is filled with water under pressure. When a home fire sprinkler is activated, this water is discharged immediately, effectively combating the fire before it has time to expand. The wet sprinkler is the more popular of the two, mostly due to its simplicity and reliability. They tend to require very little maintenance, are easy to install, and work well in several environments—you’ll often see wet fire sprinkler systems in offices. However, they cannot be used to protect a property where the temperature drops below 40 degrees Fahrenheit. For that, you’ll need a dry fire sprinkler system. As you may have guessed, the piping of these systems is not filled with water. Instead, they are filled with pressure while the water is held in a supply tank nearby. The pressure keeps the valve to the water supply closed. When a fire activates the sprinkler, the pressure drops in the piping, allowing the valve to open and the water to discharge. As we mentioned, these sprinkler systems are best for environments that often get cold, like walk-in refrigerators or warehouses. If the water was to be stored within the pipes leading to the fire sprinkler head, it has the potential of freezing in such cold temperatures. By storing the water nearby, instead of the pipe itself, the sprinkler will not face any obstacles in releasing the water when it’s needed the most. 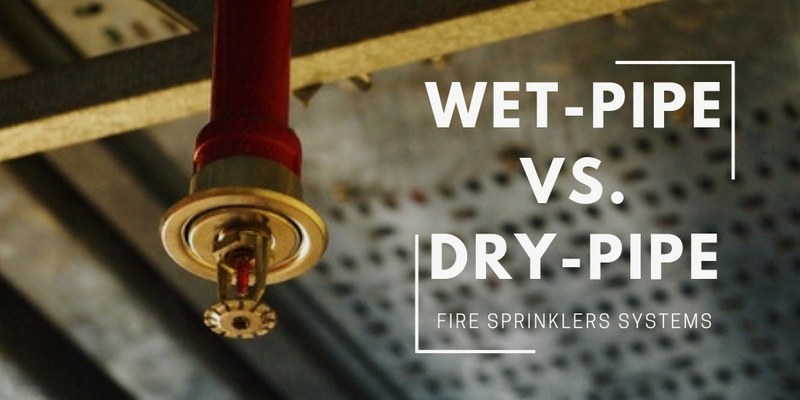 Knowing the difference between these two fire sprinkler systems puts you one step closer to ensuring the safety and well-being of you and your property. Contact the team at Fire Tech Residential Sprinkler today to determine which fire sprinkler system is right for your home or business!